In the bowl of a stand mixer, stir the whole wheat pastry flour, all purpose flour, sugar and salt together until combined. Stir in cold butter until it's the size of peas. With the mixer on low, stream in ice cold water by the tablespoon until the dough starts coming together. It should be moist, but not sticky. If you grab a few pieces and squeeze them together in your hand, they should stick together without leaving a residue on your hands. Form dough into two disks, wrap in plastic wrap and refrigerate until ready to use. Recipe will make two pie crusts. When ready to make the pie crust, remove one disk of dough from refrigerator and sit out for 10-15 minutes to make it easier to roll. Preheat oven to 400 degrees. Flour board and rolling pin and roll out dough to large circle. Place in pie pan, cut off extra dough and scallop the top edges of crust. Prick bottom of crust with fork. Bake for 10-12 minutes or until crust looks dry and top edges are barely golden. Set aside to cool. For the filling, whip cream until stiff peaks form. Set in refrigerator until ready to use. Whisk egg nog, milk and instant vanilla pudding together until smooth. Let it thicken 3-5 minutes. 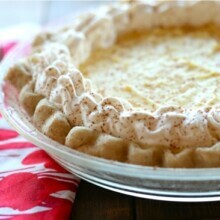 Fold half the whipped cream into egg nog pudding and pour into cooled pie shell. Cover with plastic wrap and refrigerate 2+ hours. Make sure whipped cream makes it back into the fridge too. When ready to serve, pipe whipped cream around edge of pie and top with chocolate shavings. Serve.